A racing game, but you can't drive! need to play this game on multiplayer it's very nice the idea is very smart I loved it well done. You can go check out my entry it will be nice if you rated and left feedback. That was fun. The sensibility was way to high for my taste, but apart that, I must say the physics of the tank flipping in all direction at once make it really fun ! I would love to see something like this with multiplayer. It'd be the perfect sort of "hanging-out-in-your-friend's-basement" sort of game. If only you had a back-mirror or a compass or something to help you get alinged. It was fun to blast away but only irritating to spin around to get oriented. Yeah, I didn't do this at first because I wanted it to be a bit chaotic and disorienting, but after playing it a bit I realized not having that might be a bit TOO chaotic and disorienting. I think I'll make it so if you hold down right click, it looks the opposite of the way you're aiming. The idea itself has potential and I think it was even one of the more common ones in last year's jam. However, unless this is one of your first games, in which case kudos to you for participating, the execution seems a little lackluster and lazy. The camera is super sensitive, the tank is just 3 basic shapes, and the game does not control very well. If you misplace a shot and go flying past a checkpoint, it's extremely tedious to get back to it and then continue onward. I appreciate criticism, but implying with the "unless this is one of your first games" bit that I'm incompetent and/or inexperienced because a prototype I made in under 24 hours uses placeholder graphics and isn't totally polished is kinda unnecessarily mean. I sincerely apologize. Last night I was kind of sleep deprived and I included some things in my review that weren't necessary. I was taking things way too seriously and failed to notice that the game was made in less than 24 hours. 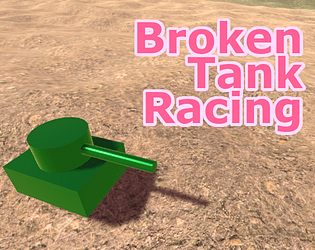 I hope you had fun making Broken Tank Racing, and I hope you'll keep experimenting with more games in the future. It was satisfying to get going really fast and hit the checkpoints. My second lap was twice as fast as the first. Mutliplayer on this would be a "blast". Very amusing game. I kept chuckling while playing it, and it's very fun to fly through the air. Bit difficult to control, but that's to be expected. Well done. That's a pretty enjoyable little game. It's a little distracting that explosions are at the center of the screen, not where the cannon barrel is facing, but it may have been a little annoying having to wait for it to face the right way before firing. If you're still working on this, I would add some obstetrical to the map to make things a little more interesting. nice game! very cool idea!